This unique feature is dedicated to all the women behind the scenes who work tirelessly and are the true force behind all our wonder women. These moms do not seek attention or appreciation. Their biggest joy is to see their children do well. 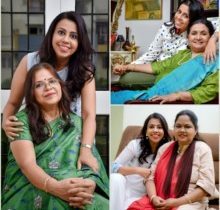 Today, I would like you to meet our wonder woman, Payal Gupta and her three mothers! Payal is a chef, food stylist and a floral stylist working out of Mumbai. She was born in the City of Joy, Kolkata. Raised lovingly in a joint family, Payal went on to complete her graduation in Economics. Her first professional adventure was to move to Mumbai and work as a qualitative researcher. Later, inspired by her childhood passion for arts and food, she quit her job and educated herself to be a chef in Thailand. She further honed her skills and became a food stylist and floral designer. She went to IIMB to grasp the nuances of business management. Today she runs the nation’s top food styling company called www.chefpayalgupta.com with her husband. She is the creative mind and artistic touch behind the successful advertising campaign of a plethora of food brands in Asia. Payal’s life and work has found innumerable mentions in leading tabloids. She recently received her first international Citation by Femina and World women leadership Congress for her contribution to the food industry. She was also declared amongst the 50 most influential women in social media by Social Samosa in 2018. Shila Gupta, is Payal’s biological mom and hails from a quaint little village in Bihar. Her unique sense of discipline and a strong ‘never give up’ attitude in life, is inspirational. When Payal was 5 years old her father was diagnosed with a disease which left him unable to handle financial duties at home. Payal’s mom took up this situation like a peaceful warrior. She educated her kids, cooked for them and nursed her husband for 25 years without slightest reservation. It’s due to her efforts that after 25 years, her husband, was declared almost fully fit. Today all her kids are very well settled and have made a mark in their respective fields. So while Payal is an artist, her elder brother is a restaurateur and younger sister, a storyteller. Payal believes that her own strong spirit, comes from her mom. Like her mother, Payal is a fighter and does not think anything is impossible. Her mom was her inspiration each day while growing up. Till date when Payal is stuck with some situation she goes back in time and draws strength from her mother’s life. When Payal was going through a divorce 5 years ago, it was her mom who gave her the courage, to move on and restart in life. The loving mom-Devi RavindranathanTwo words define this 75 year old Malayali woman named Devi Ravindranathan a staying from Bangalore-‘Unconditional Love’. Mrs.Ravindranathan is Payal’s spiritual mother. She has two grown up daughters who are married and stay overseas. Payal was introduced to Mrs.Ravindranathan through her spiritual center-Sukyo Mahikari. Post her divorce and graduation as a chef when Payal was making efforts of settling down, Mrs. Ravindranathan was the one who held her hand. She loved Payal like her own daughter. She educated Payal to be a floral designer and helped her to apply for IIM (B) and complete her MPWE program there. She inspired Payal to get remarried in December 2016 and till date continues to be a pillar of strength for her. All of us in life are born with some relationships given to us by the creator and some we create our self. This is one such beautiful relationship to watch and witness where the give and take is purely love!! Payal is the daughter in law of Seshmani Jutta. When Mrs. Jutta learnt that her son was in love with Payal (who was divorced) unlike most mothers she did not judge Payal. She did not question Payal’s past or discourage her son. She was very empathetic towards Payal and prayed for her happy life. Her son married Payal in December 2016 and she was overjoyed to have them married. Till date, she continues to love and nurture every aspect of Payal’s life. In a society where judgements are a daily part of her life, this attitude is inspiring!! Not only does this post cheer for all the women who are the unsung heroes and inspiration behind our wonder women, it is also important to note that, just like Payal, we may find strong maternal figures in any woman and not only our biological mothers! I am her father; I deleted suffix in-law because I always wanted a daughter to come to our house. She is an asset to the hamily.